Arlington, VA – March 16, 2011 – PBS KIDS will host its sixth annual PBS KIDS “Share the Earth” celebration in honor of Earth Day by featuring new and favorite episodes encouraging children to care for and respect the environment. From April 18 – 22, families can view brand new eco-friendly episodes on-air from SID THE SCIENCE KID, CURIOUS GEORGE®, MARTHA SPEAKS, WILD KRATTS, and ARTHUR, while learning about recycling, habitats, alternative energy and more. In addition, favorite Earth-focused episodes from SUPER WHY!, WORDGIRL®, and more will also be airing throughout the week. The “Share the Earth” celebration continues online for both kids and parents. 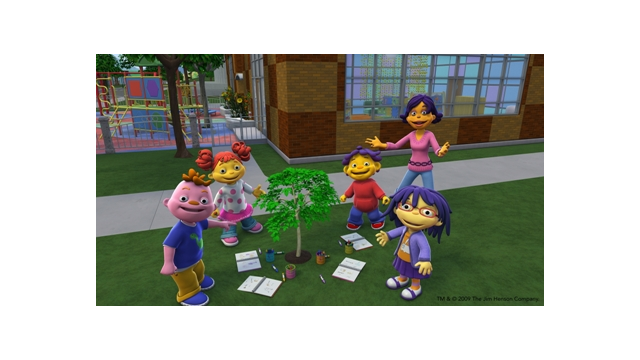 PBSPARENTS.org will feature a special “Simple Ways to Protect the Earth” page with new ideas for activities parents can do with their kids in celebration of Earth Day, such as gardening and craft ideas. An Earth Day channel on both PBSKIDS.org/video and PBSKIDSGO.org/video will feature Earth-themed episodes from favorite shows such as THE CAT IN THE HAT KNOWS A LOT ABOUT THAT! and WORDGIRL from April 15 through 22. In addition, a new web exclusive episode of DESIGN SQUAD NATION, “Sustainable South Bronx,” will run on PBSKIDSGO.org, along with accompanying eco activity ideas for kids. Following is a listing of the episodes airing the week of April 18 -22 (Check local listings for air dates and times). SID THE SCIENCE KID NEW “Where Did The Water Go?" ("What happens to water that goes down the drain?") While brushing his teeth, Sid wonders what happens to all the dirty water when it goes down the drain. At The Science Center, Sid and his friends explore how water travels in and out of our homes through pipes. And here's something Sid and his friends never realized: there's lots of water in the world, but you can't drink it all! We can only use fresh water, and there aren't a lot of fresh water sources in the world. That's why it's important not to waste water! NEW "Clean Air!" ("Why does Sid's Dad wear a mask when he paints?") Sid the roving reporter is investigating something strange in his backyard--his Dad is wearing a mask while painting. Sid discovers that his Dad is protecting his face so he doesn't breathe in the dirty fumes. At school, Sid and his friends discover that people and animals on Earth need to breathe clean air, and when we pollute the air around us, it affects the air that everyone breathes. The kids also discover that trees have a really important role in keeping our air clean! NEW “Reused Robot" ("Where does trash go when we throw it away?") Sid's toy robot is broken, so he wants to throw it "away." Sid's Mom tells him there is no such thing as "away," and when we put something in the trash, we are actually creating waste. Sid and his friends explore the idea that everything we throw away goes somewhere. This leads to an investigation of how to recycle and reuse items so that we make less trash. NEW “Save The Stump" ("Can an old stump be a home for tiny creatures?") Sid is super excited because his Dad is clearing out space in the yard for a basketball court! While Sid and Dad are surveying the land, Sid notices a big stump teeming with little creatures! During a special field trip to The Science Center, Sid and his friends discover that there are animal habitats all around us, even in old stumps, and if one habitat is destroyed, all of the other habitats and animals are affected. MARTHA SPEAKS NEW “Wagstaff Races”/ “The Missing Metal Mystery” “Wagstaff Races” - Wagstaff City's environmental club is having a "Go Green Go-Cart Race," fueled by alternative energy. Using sun, wind, and pond scum, the gang gathers at the starting line. Who will win the trophy — and most importantly, how? “The Missing Metal Mystery” - Who’s been stealing things from the local junkyard? When Detective TD announces the identity of his main suspect, everyone is shocked. WILD KRATTS NEW ”Falcon City” The Kratt brothers are itching to fly with the world’s fastest animal, the Peregrine falcon, which can hit top speeds of 240 mph. But their efforts are side-tracked when the rest of the Wild Kratts team challenges them to find the falcon in the city instead of in the wild, and Chris’ Creature Power Suit is accidentally activated with Pigeon Powers! But then they discover that Zach is sending his Zachbots to clean off a building that has a peregrine falcon nests with chicks. Martin and Chris must activate their Peregrine falcons powers and harness the force of gravity to pull off a high flying creature rescue! ARTHUR NEW “Follow the Bouncing Ball”/ “Buster Baxter and the Letter from the Sea” “Follow the Bouncing Ball” - Alberto Molina’s beloved soccer ball, signed by his favorite Ecuadorian soccer star, El Boomerang, is lost! Is it the same soccer ball bouncing all over town, eluding potential captors?! This kicks off the first of 10 stories which follow the incredible journey of “El Boomerang” around the world! Come, follow the bouncing ball! “Buster Baxter and the Letter from the Sea” - While on vacation with the Read family, Buster discovers a message in a bottle on the shore. Could it be an urgent message from the people of the Lost City of Atlantis? Buster is determined to find out and sends them a message back…by throwing his own bottles in the ocean! Will he learn that keeping the beach and waters clean is the real message? “The Cherry Tree” Muffy will do anything to have a gigantic Dream Bouncy Castle at her party, or so she thinks. When her favorite cherry tree is cut down to make room for the castle in her yard, she starts to have regrets. Then to make matters worse, she learns that cutting down trees hurts the environment, too. What can Muffy do to fix the damage she’s done? CURIOUS GEORGE NEW “Follow That Boat”/“Windmill Monkey” “Follow That Boat” – Steve needs an A to pass his history class and his model papyrus boat is sure to make the grade. George helps him test the boat in Endless Park’s pond, but a sudden rainstorm sweeps it down the sewer grate! While searching for the boat, Steve and George learn that debris from the street ends up in the ocean. Will they ever find Steve’s little boat in the big ocean or will he be taking history again next year? “Windmill Monkey” – George proudly finishes planting his rooftop garden when he turns around to find that Compass and his friends have eaten all the seeds. The scarecrow overlooking the garden didn’t scare them at all! While buying more seeds, George spots a windmill and learns how the wind can power just about anything. The inspired monkey sets out to create the world’s first wind powered scarecrow in hopes that will keep his seeds safe. But some things are more easily planned than done! SUPER WHY! “Tiddalick the Frog” Whyatt’s mom tells him that he’s wasting water. This is a really big problem and he's not sure how to fix it. So the Super Readers dash into the Australian folk tale of Tiddalick the Frog and make the acquaintance of a funny amphibian whose puddle jumping is using up all the water and leaving his neighbors in the dust – literally! As the Super Readers help Tiddalick and his dry friends, they learn how important water is to the planet, along with a valuable lesson about conservation. CYBERCHASE "The X-Factor" All is not well in Perfectamundo, a dome-enclosed cybersite, when orange spots are discovered building up on the dome’s interior surface, blocking the site’s precious sunlight. What source could be responsible for the spots multiplying so fast? Is it Hacker’s new factory that pours out orange clouds through smoky stacks? It can’t be that new Digifizz toy, with its tiny burst of colorful sparkles shooting into the air each time it gets used. With time running out, the CyberSquad must come to grips with the power of multiplication and use it to undo the site’s pollution problem. ANGELINA BALLERINA™ THE NEXT STEPS “Angelina and the Dance-a-thon” Angelina and her friends organize a dance marathon for the Chipping Cheddar Earth Club as part of their "Camembert Cares" school project. After Gracie accidentally recycles the pledge sheet, Angelina uses her ingenuity to save the day! WORDGIRL “EARTH DAY GIRL” When the villainous (and very large) Birthday Girl learns that planet Earth is having a special celebration on the same day as her happy occasion, she decides to wreak environmental havoc, just to teach the Earth a lesson. Can WordGirl find a way to stop the Birthday Girl’s eco-rampage and save Earth Day? MAYA & MIGUEL™ “EVERY DAY IS EARTH DAY” For a school Earth Day project, the kids decide to clean up an old lot and plant a community garden. But as the deadline approaches, a rainstorm hits, turning the patch of dirt into a muddy mess. How will Maya get her friends out of the muck this time? THE ELECTRIC COMPANY “The Flube Whisperer” Keith sends away for a Skeleckian pet that lives in a biosphere. But when the biosphere malfunctions, will Manny save the day? CLIFFORD THE BIG RED DOG® “Doggie Garden” It’s Keep Birdwell Beautiful month and the kids are doing their part by planting a flower garden. Seeing this, the dogs decide to create a doggie flower garden of their own. But when Cleo hears that almost anything grows in Birdwell Island soil, she decides she’d much rather grow a garden full of dog toys! She soon learns, however, that working alone for a selfish end is not nearly as rewarding as working together for the whole community. BARNEY & FRIENDS™ “Home Sweet Earth: The Rainforest”It’s Earth Day, a great time for everyone to learn how to help take care of our world, but Ben is wasting paper while BJ isn’t too concerned about cutting down a tree to make room for a new playground. After a trip to the rainforest and a meeting with Mother Nature, everyone learns the importance of taking care of our world. As Earth Day comes to an end, Barney reminds us all that taking good care of our Earth is the natural thing to do for the people we love. PBS KIDS, the number one educational media brand for kids, offers all children the opportunity to explore new ideas and new worlds through television, online and community-based programs. More than 21 million children watch PBS KIDS on TV, and more than 21 million engage with PBS KIDS online each quarter. For more information on specific PBS KIDS programs supporting literacy, science, math and more, visit PBS.org/pressroom, and follow PBS KIDS on Twitter and Facebook. Curious George is a production of Imagine, WGBH and Universal. Curious George and related characters, created by Margret and H.A. Rey, are copyrighted and trademarked by Houghton Mifflin Harcourt Publishing Company and used under license. Licensed by Universal Studios Licensing LLLP. Television Series: (c) 2011 Universal Studios. All Rights Reserved.